In-market Audiences launched back in May, helping you leverage artificial intelligence (AI) to target curated lists of customers who have shown purchase intent signals within a particular category. (In-market Audiences is only available within the United States.) 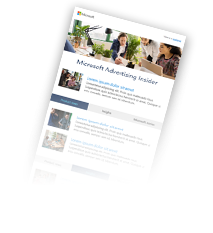 With this Bing Ads Editor release, you can now create, modify, and delete your In-market Audience associations and negative In-market Audience associations in bulk. Learn more. Let’s say you’re a car entertainment supplier looking for potential customers ready to buy new car audio systems. Bing Ads finds audience segments who have recently shown interest in this category via search and online activity for car audio systems or related products. You can simply associate the "Car Audio" audience segment with one or more ad groups at once, to instantly reach them knowing they are ready to buy. Example showing In-market Audiences associations in Bing Ads Editor. On the other hand, if you want to make sure your ads are not shown to users interested in other audio products, you can use negative audiences (or "exclusions") to exclude certain categories, such as "Stereo Systems." 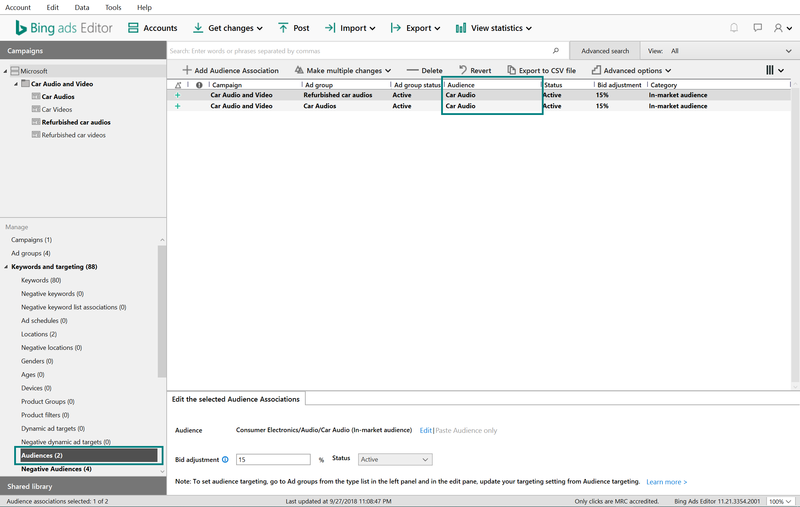 Example showing how to exclude In-market Audiences in Bing Ads Editor. Choose the In-market Audiences categories that best align to your business goal. It's important to start with the right set of customers, to help you focus your budget on people who matter to you. Associate the In-market Audiences to existing top-performing ad groups as "bid only" with 20% bid adjustment and monitor for 2 weeks. This allows you to quickly compare the performance of ad groups using In-market Audiences against those not using them. Use Remarketing, Custom Audiences and In-market Audiences together to help you get the largest reach and impact. Remarketing and Custom Audiences let you target existing users who have bought before or those who have interacted with your site but have not yet converted. In-market Audiences allows you to expand the reach to those who may not have interacted with your site but are ready to buy. Make sure all existing audiences associated with the ad group can be used as "bid only" before you change the targeting setting ("bid only" or "target and bid"). Targeting setting is an ad group level setting and is applied to all new and existing audience associations regardless of the audience category.